One benefit to having some extra time to kill before spin class about a month ago is that I came across a really cool (literally) scarf. It looks kind of like a rolled up bandanna but it actually has some kind of absorbent gel inside. This scarf came in real handy on Sat when I decided to do my 10 Mile long run outside. Your supposed to soak this in water for about 5 minutes prior to using it and then pat the outside dry with a towel. I usually just run this under the faucet for a couple minutes and lightly dry it. I wear the scarf tied around my head like a bandanna and not only did this scarf keep me cooler but it also helped keep the sweat off of my face for the entire length of the run. These scarfs are available at Walmart for about $4 and are reusable for hundreds of times. Eventually the gel is supposed to disintegrate which will limit its cooling abilities but so far it seems like the life span of one scarf is likely to be several months at least. I plan on wearing the scarf in a couple weeks for my half marathon run and look forward to a nice cool run with it. Sorry for the infrequent posts lately. I have been building my miles up to get ready for my next race. I am jumping from a 7k in the middle of March to a half marathon on June 3rd. Both races were put on by one of my preferred organizations Team Ortho. I like this organizations races so well because they are well organized in general and have massive numbers of runners turning out for their races. The 7k I did was Get Lucky which had over 8k people on a 7k course which is a logistical nightmare but they managed to pull it off in style. I am currently training for the MPLS Half Marathon which is on a similar course to the 7k though they did have to make some modifications as several of the bridges that had been there in years past are currently not their anymore (MN construction season) This course change means a flatter course as well which will mean many of the runners are likely to get a new pr on the course. I have been training for this race with what some may call a crazy training plan that I concocted on my own. Below is the table of what my training plan looks like for those who are curious how to triple milage in 6 weeks. This plan allows you to gradually add mileage while building up to the race. I am currently on the 4th week and I must say this plan is keeping me on track for the most part. I only shorted one of the Monday runs so far and that was because I was not feeling well at all. Otherwise this plan has been very helpful to me in getting my mileage up in time for the half marathon. I plan on creating a similar plan but including some plateaus to allow myself to better acclimate to the distances once this race is over and have it continue on from 13 miles up through 20+ miles so that I can be ready to run some marathons in time for next year. The ultimate plan is to sign up for the longest distances on the entire Team Ortho Monster Series next year and possibly throw in an ultramarathon at some point next year as well but we will see how I do. I chuckled a little at this the first time I saw it about a year ago but after thinking about it for a while I have to agree. If your ready for the Zombie Apocalypse then your ready for any disaster out there. 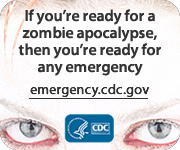 The CDC is excellent at planning for just about anything. I would say you could take their disaster preparedness plan and re-use it for darn near anything you need to plan for. Going for a camping trip? Your going to need to plan for a clean water supply as well as food, clothing, shelter. Don't forget a few tools like an ax, shovel, and flashlights + batteries. First aid supplies also come in handy when you least suspect them. Below is the CDC short list to pack for. I would wager if you used this to pack for anything from a day trip to a month long hike through the woods that you would survive and come out fairly healthy. I also believe anyone following this automatically should earn at least a couple Boy Scout Merit badges. Ok folks I realize I didnt keep up on the gas coupon before. To make up for it here is a sheet of .12 and .20 cent coupons http://bit.ly/xR1OZ1. These coupons are valid till March 10th, 2012 and will be accepted at most SA stores (.20 coupon must be used at locations with a wash). Also remember most SA stores in the metro also double competitor coupons on Tuesdays. Enjoy. I have been training with a purpose lately. I signed up around christmas for the Team Ortho Get Lucky 7k race. I have been focusing mainly on speed training as I have always been a slow runner. Today I did my first long slow distance run and went the full 4.5 miles or 7k oops :D.
This has me thinking if maybe I shouldn't find a longer race to run sooner than I had originally planned. My plans were originally to do a half marathon before the end of 2012. With these big leaps forward in my running endevours I am thinking about signing up for the Red, White and Boom race on the 4th of July. I think I could manage to train for that race as its about 5 months out and only 3 times further than I am currently running. My biggest concerns are that because I am such a slow runner I don't know if I could finish that long of a run in the alloted 3.5 hours. Theoretically at the rates I am able to run at today I could finish with a half hour to spare but thats cutting it a little close for my liking. Plus if I take too long of a walk break I could end up being picked up by the sag wagon. 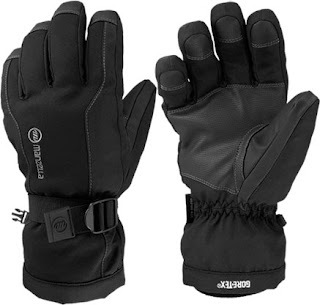 I have been testing out the Manzella Fahrenheit 5 Gloves this week since the weather has turned nice and cold. So far I can say these are some of the lightest yet warmest gloves I have ever owned. Being a Minnesota resident I can attest these gloves will keep your hands warm well into the -10 degree range with a -25 to -35 degree windchill. Due to the abnormal dimensions of my hands (I have wide hands with shorter fingers) I don't believe that I will ever find a pair of gloves that will "fit like a glove". In my case I always seem to either have excess material in the finger tips or I have a difficult time getting my hands into the gloves. These gloves are no exception I have about an extra half inch or so of glove left in the fingers; But I can easily slide my hands into the gloves which is the way I prefer the glove to fit around the hand anyway. I did follow Manzellas' sizing chart and the dimensions matchup perfectly to the chart. I also really like the wrist straps to allow you to snug the gloves down tight around the hands and help lock out any breeze's that might try to squeak through. There is also a nice quick release so that when you're not wearing the gloves you can snap them together and not have to worry about misplacing one of them. The gloves are very comfortable to wear. They keep the hands feeling warm but not to the extent that your hand would start to sweat in most situations which is just what you want in a pair of gloves. If your hand were to start sweating quickly in the glove then your hands would quickly become cold. Around the wrists there is also a nice interlock with a soft inner material that can be tucked into your jacket sleeve with a separate outer fabric that goes on the outside of your jacket sleeve. This interlock of fabric helps prevent breezes from getting both into the glove as well as into the jacket. The gloves have a very functional design with black being the only available color in this style. Every component of the glove seems well thought out right down to the palms with a synthetic leather to prevent the palms from wearing out quickly. This leather also seems to have a bit of stick to them which is nice to prevent anything your holding from slipping out of your hand. The insert fabric is Gore-Tex with 200 grams of insulation which makes the gloves a wonderful breathable waterproof and warm addition to anyones winter clothing box. Hello everyone its me again. So here it is what you have all been waiting so long for. The review of my BodyBugg Weight Loss Management System and a few barbs at Justin Beiber and his funny hair-do. I have been wearing my BodyBugg for the past several weeks now and have a fairly good idea now of where it excels and where it fails. The system is fairly accurate at gauging calorie burn however it would be nice if it would also monitor heart rate and possibly blood pressure. Comfort: I think the BodyBugg is very comfortable. I usually dont even notice it once its strapped to my arm and I put a shirt on. Initially there was some irritation which I think was due to wearing it to tightly. Once I loosened it up slightly that seems to have vanished. They recommend you leave the bugg off body for about an hour each day however I have been fine with less time. I recommend not undoing and redoing the velcro constantly as the velcro doesnt seem to be real high quality and seems like it will wear out quickly if you do that. Charging: My BodyBugg generally holds its charge really well. I have not synced most of the week and it still has plenty of charge to carry me into the weekend. It seems like the battery for such a small device is impressively long. It took a couple hours to recharge and if you plug it in to sync daily you likely will never deplete the battery significantly. Website: The website seems to be fairly user friendly but I do have a couple issues with it. The food list is relatively extensive however it would be nice if more fast food chains menus were included. There seems to be only a handful of menu items from each restaurant currently pre-entered. I also wish it would stop switching between the food log and body measurements after you update your body measurements. Otherwise it is very easy to add new food items and create menus on your own. Syncing the body bugg couldnt be much easier though it would be nice if it was supported by more than just Internet Explorer for doing the sync. Overall I am very impressed with this little gadget. I would highly recommend it to anyone who is having difficulty in loosing weight. © 2011 Barefoot Matt Inc. Copyright 2011 Matt Fiereck. Powered by Blogger.